Zeus Street Geek fries took out news.com.au's top spot as Australia's best fast food fry. IT TAKES superhuman strength to walk past someone eating hot chips and not crave some. Our tastebuds have been hardwired to find that combination of crunch, salt and oil addictive - think potato chips. So when you add heat, it's game over. But what makes a great fry? 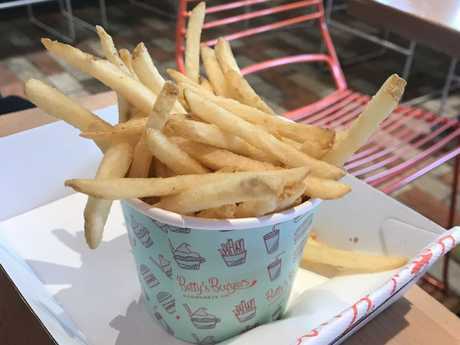 There are those that swear by sharp crunch of shoestring fries while others prefer the pillowy, potato bite of a fatter chip. You have the sticklers for regular salt versus those who favour the MSG-heavy hit of chicken salt. In order to find out, News.com.au visited 10 fast food outlets in one day to compare the carbs. 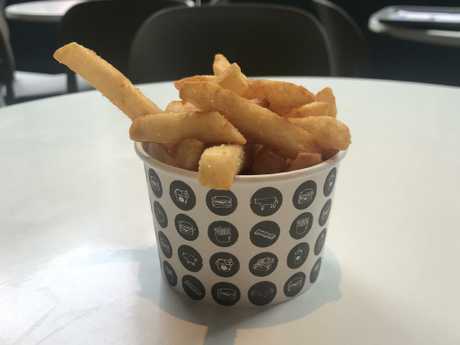 While each state has their standout deep-fried potatoes, such as the duck fat fries at The Morrisson in Sydney or Melbourne's Biggie Smalls which seasons crinkle cut fries with brown butter and preserved lemons, we went for fast food chains with multiple outlets across Australia. We compared like-for-like and ordered the medium or equivalent, ate them in-house while they were still fresh and ignored sauces or extras that would skew the rating. We judged them on heat, crunch, potatoey-ness and seasoning. Here's our rating. McDonald's french fries rated the worst of our top 10. 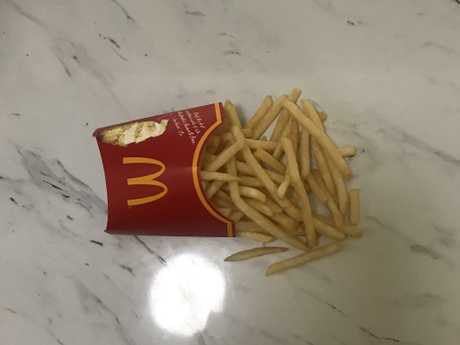 A good Maccas fry is the ultimate; hot, skinny, crisp and salty it's more about the crunch than it is the potato. It's the taste of childhood treats and late-night feeds, cut super-thin so you can maximise how many you can cram into your mouth at once. On this occasion though, they fall flat. Sure, the taste is satisfyingly familiar, nicely salted with a little bit of crunch, but they are warm. And everyone knows, you've got to eat them while they're hot. Initially, we are willing to give them the benefit of the doubt as it's the first stop on our tasting tour, but everyone else served up theirs hot. Lukewarm just doesn't cut it. For more information visit mcdonalds.com.au. 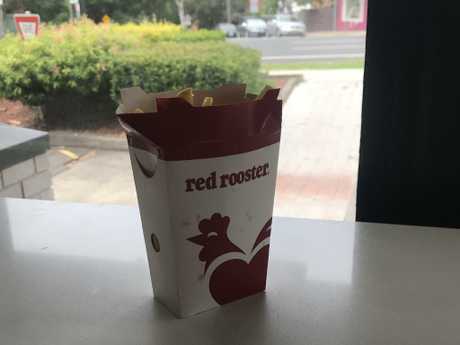 Red Rooster is a suburban Aussie version of KFC. This fast food chain is a suburban Aussie version of KFC. It's got the same colours, similar packaging, parallel flavour profile but you have to get out of the CBD to find it. The chip is more golden and slightly crunchier than the one at KFC and is very heavily seasoned. Take a few fries, and you'll see your fingers are covered in chicken salt. It sounds good in theory, but you can have too much of a good thing. But if you're a fan of the more-is-more philosophy, loaded fries and onion rings are also available. For more information visit redrooster.com.au. KFC had "the palest and floppiest out of all the fries". These were the palest and floppiest out of all the fries, lacking the golden exterior and missing crunch. But everyone knows KFC chips don't conform to what is expected of a fry, their reason for being is less side dish, more vehicle to scoop up the gravy. The seasoning was another way they separated their offering, not only was the mixture of 11 secret herbs and spices used on the chicken, but it extended to a secret seasoning of its chips too. On this occasion, the distinct flavour in the seasoning was more chicken salt than herbs or spices. But on the plus side, they were steaming hot. For more information visit kfc.com.au. There's just one size available at Betty's Burgers. It's more fast-casual than fast food, you line up, order at the counter, get a buzzer and wait. And wait some more, but at least you know they are being cooked to order. Beware, they will upsell sauces. The shoestring fries are based on the American ideal of what a chip should be - hot, crunchy and crispy. But they are a tad over-salted. For more information visit bettysburgers.com.au. 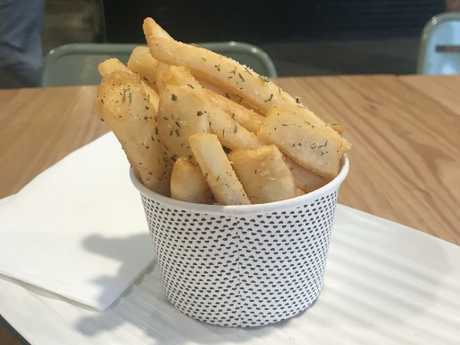 Grill'd chips are also dressed up and seasoned with rosemary and salt to give them a point of difference. Order at the counter and be prepared to be upsold a sauce for $1. It's only a buck, but still, it feels stingy. In keeping with its gourmet burger ethos, the chips here are also dressed up and seasoned with rosemary and salt to give them a point of difference. But it's excessive; you taste the rosemary more than the potato. The shape is also unique - a wider, flatter fry that presents more surface area. While most of the pieces are long, they also have the smaller, crispy bits lurking at the bottom of the bucket. For more information visit grilld.com.au. 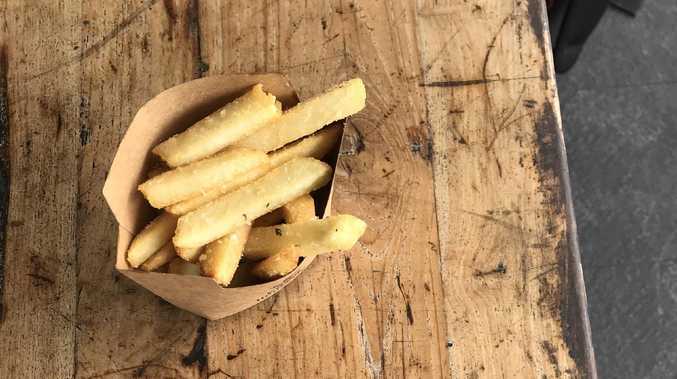 At Huxtaburger, it's all about the exterior of the chip rather than the potato, with each bite bringing another hit of texture to your tastebuds. Order at the counter, take a number and have your just-cooked fries delivered to the table. The beer-battered fries are golden, piping hot and super crunchy. It's all about the exterior of the chip rather than the potato, with each bite bringing another hit of texture to your tastebuds. They've got the crunch you expect of skinny shoestrings, but there's more to bite into so both camps of chip-lovers will be happy. Seasoning is inoffensive. If you're not a fan of super-salty spuds, there are for you. For more information visit huxtaburger.com.au. 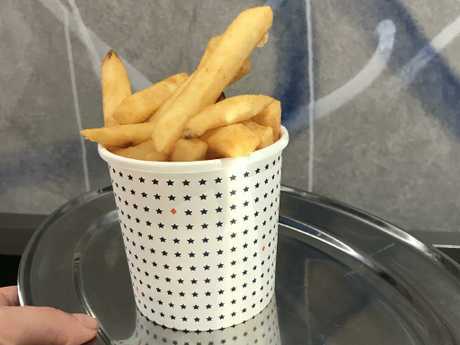 Hungry Jacks fries beat rivals McDonald’s in our taste test. 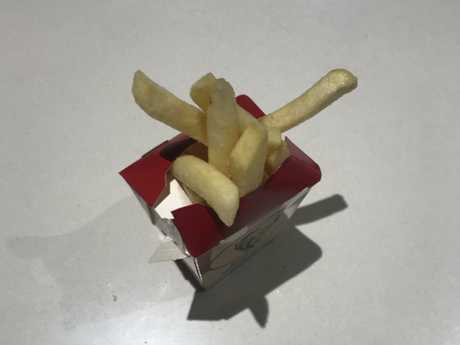 The shoestring fries synonymous with American fast-food outlets was swapped out for a thicker, Aussie-style chip in 2016. 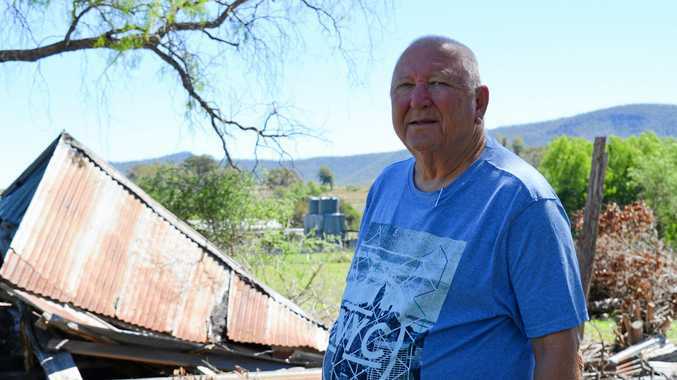 It's a smart move, separating their offering from McDonald's because Hungry Jacks has always been seen as a second-rate version of the golden arches. The chips are hot and well-salted. There's not as much crunch as a shoestring fry but you can taste the potato. For those that are into MSG-based seasoning, you can upgrade to the BBQ Shapes shaker chips for $3.50, a sachet of seasoning based on the beloved savoury biscuit. 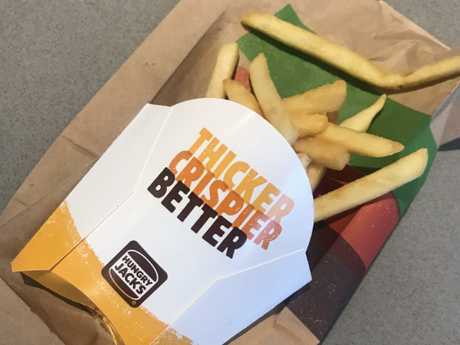 For more information visit hungryjacks.com.au. 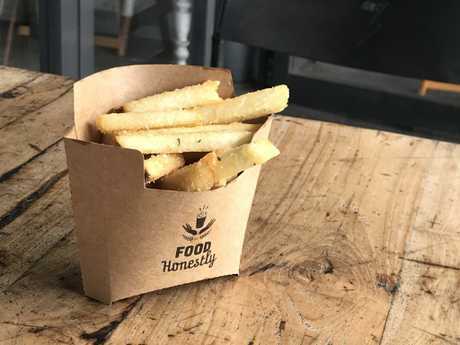 These fries come in a cardboard box with a lid plus a little wooden fork. Breaking a fiver for fries sounds outrageous, but this is a massive portion. The kids' size would be closer to the regular offerings of other outlets. As the name suggests, this vegan takeaway takes its fries seriously, choose from classic, chunky, shoestring and sweet potato. We go classic; the mid-point of a shoestring and a fatter fry. They come in a cardboard box with a lid plus a little wooden fork. They're hot, well-seasoned and crunchy but what's most impressive is that you can see the potatos skin. They haven't peeled the potatoes, which makes you feel like you're eating a vegetable rather than just a deep-fried crunchy baton. 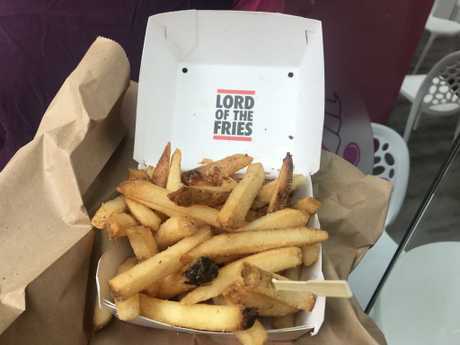 For more information visit lordofthefries.com.au. Props to Burger Project for having self-serve tomato sauce and mustard at no extra cost. You expect the offering to be a little bit fancier when chef Neil Perry is involved, and it is. Order at the counter and wait for your buzzer to ping as your chips are cooked to order rather than coming out of a bain-marie. This means they are hot enough to burn your tongue, so you need to do that little mouth-dance where the food jumps around your greedy gob, giving it time to cool before chewing. Or learn from my mistake and be patient. They're well-spiced, crunchy and have those small crispy bits that everyone fights over. Props to having self-serve tomato sauce and mustard at no extra cost. You can also choose from chipotle chilli or Sichuan pepper salt on your fries. For more information visit burgerproject.com. Zeus Street Greek fries taste like something you'd get at a restaurant rather than a fast food outlet. These are Yia Yia's chips, the kind of fries a Greek grandmother would make, sprinkled with pink salt and oregano. You can also add feta for $1. Order at the counter, get a number and wait as they're cooked to order. These chips are crisp rather than crunchy and the fattest we came across all day, about a centimetre thick. The insides are soft, fluffy and you can taste the potato. Like Grill'd, the herb seasoning is a point of difference, but here it enhances the spud rather than overwhelms it. They taste like something you'd get at a restaurant rather than a fast food outlet. This is the ninth stop on our eating tour, our tastebuds are tired and we're just having a few chips at each location but we find ourselves finishing the serving. 'Nuff said. For more information visit zeusstreetgreek.com.au.